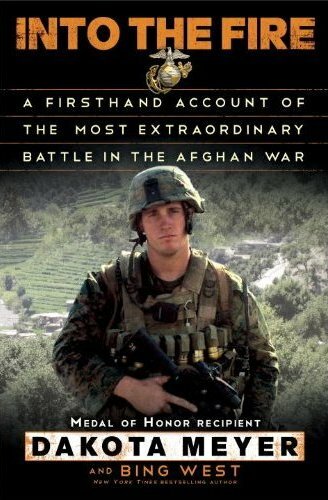 Medal of Honor recipient Dakota Meyer’s new book is scheduled to be released in September, three years after the devastating battle that led to his heroic actions. “Into the Fire: A Firsthand Account of the Most Extraordinary Battle in the Afghan War” will be available Sept. 25, according to its listing on Amazon.com. The 272-page book is written by Meyer and Bing West, a Marine veteran who has authored several best-selling works. It will be published by Random House, which also has it listed on its website. In September of 2009, several hundred Taliban ambushed a company of Afghan soldiers and their Marine advisors. The enemy had the company pinned down, with only one exposed road leading in and out of the village. Twenty-one-year-old Marine Corporal Dakota Meyer disobeyed his commanding officer and took command. Without reinforcements or artillery support, he charged forward down the only road five times under withering fire. He killed a dozen Taliban and rescued 18 Afghans and Americans. The company finally rallied and the enemy pulled back. When the story finally became known, Dakota was awarded the Medal of Honor, the United States highest honour. Yet the story of that day remains mired in controversy even now. For a man to charge into fire once requires grit; to do so five times is beyond comprehension. Dakota’s performance was the greatest act of courage in the war, because he repeated it and repeated it. In this fast-paced narrative of non-stop action, we hear the story from Dakota’s own perspective, and come to know our narrator as a true American hero: a young man raised on a cattle farm in Kentucky with uncompromising morals and a fierce determination to do what’s right. The numbers of individuals saved and killed were later called into question in a report by McClatchy journalist Jonathan Landay, who was embedded with the unit ambushed that day. It seems likely that the publication of this book would seek to set the record straight. We’ll be paying close attention to the details in the book here at Marine Corps Times. Since 2009, we’ve published four cover stories heavily influenced by the Battle of Ganjgal. Thanks for the heads up! Can’t wait to get this. Dakota Meyers does not have to make any excuses to me for anything, he is a great American. I look up to him he did not fail as he feels he did all he could to bring his fellow Marines back alive, sadly it did not happen. But a failure it was not. GOOD JOB DAKOTA MEYERS!!! BRAVO!!! Dakota I watched you this AM on Sunday Morning and have seen you speak of yourself as a failure on another show when you received your medal of honor. I grew to manhood during Viet Nam and was not able to serve medically.Today I understand very clearly war is not what you see on TV. I am always taken back by your bravery and although I would never pretend to have a clue as to what you’ve been through what I can say is from this Americans standpoint you are a hero, hands down. The men who were taken have to be looking down on you with gratitude and smiles on their faces thinking of all you did to your maximum ability and saying…God Bless You Marine,God Bless you my friend, Thank You for doing what you could! We will never forget what you did and neither will I. Only God could have changed that outcome and He had to be with you for sure. You make the rest of us proud to have brave men and women stand for America. I will always remember you in my prayers and hope God will grant you peace and a happy life.